I was told not to expect much faster internet but that I would again have unlimited phone call coverage. So I was shocked when I went into my Modem and discovered that my new speed settings were 0.764 up by 18.942 Mb/sec down. And I figured that they may be offering that speed but that there was no way I would be getting even close to that. Peter, the 389 package no longer has any free phone calls to the US and CA??? NO, it still has free phone calls to the US and Canada. It is just that you have a limited number of calls or minutes of long distance calls, I do not remember which. how do you determine the 1070 meter figure? 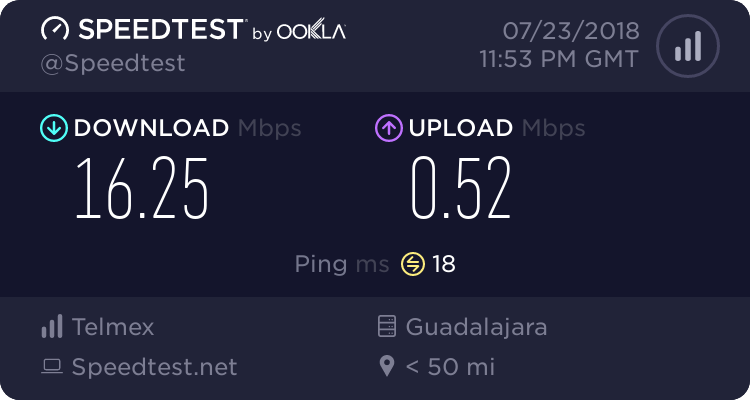 Is there something on the speed test that indicates that? When at the Telmex office, they brought up my account, available only to them. It showed the 1070 number. It could have been 1080, I don't remember. I am lucky. Apparently the quality of the internet between my house and the hook up point is average to good. Often it is not very good. Not everyone is going to find a speed difference. It all depends upon the quality of the connection to the internet.